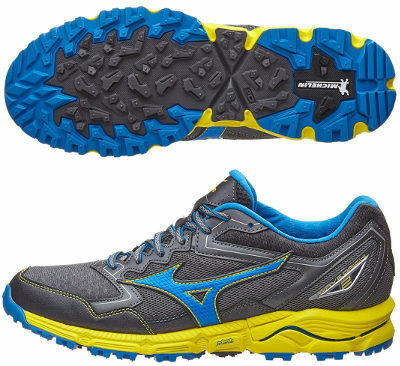 Mizuno Wave Daichi 2 are neutral trail running shoes. The versatile Mizuno Wave Daichi 2 updates the all-purpose trail running shoes from the japanese brand, one step below potent Wave Mujin 4 and one above more agile Wave Hayate 3. Current second edition keeps 12 mm drop while becomes heavier because of added reinforcements in upper to increase durability. As typical versatile trail running shoe, the Wave Daichi 2 performs well on almost any terrain but mud where small lugs may not get enough grip. Major change compared to its predecessor Wave Daichi takes place in the upper where new reinforcements and thicker mesh protect better from snagging and typical debris when running off-road and provides a more secure and snug fit. Well padded tongue features a double grommet to secure lacing and prevent slipping although a useful lace pocket is unfortunately missed. Rest of Wave Daichi 2 remains the same emphasizing the impressive outsole made in collaboration with renowned french tyre manufacturer Michelin with great flex area in midfoot (Xta Groove) delivering extra flexibility for uneven ground adaptation. Midsole is typical Mizuno one and offers reliable cushioning based on well known AP+ foam combined with concave Wave™ and innovative U4icX™ under the heel to improve comfort with soft sock absorption.